I've been wanting to do this to one of my dresser mirrors for a while now. I have a stack of these. I find them all the time. 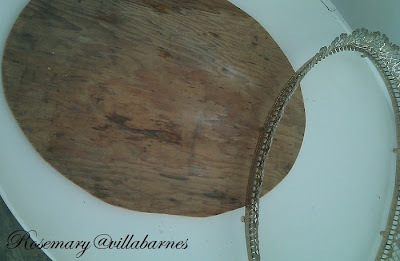 I removed the mirror, and, using it as a template, cut a piece of wood to fit. I'll be using the mirror in another project. Next came a white finish, and faded roses. You can transfer a design, or stamp them on. The heat wave has tempered here. I was able to get back in the garage, and take a good long look. Then, I walked back in the house, and took a good long look. The sales I've had this year were anti-climactic. I never get to everything. There are always things I wish I'd pulled out, finished off, taken out of boxes, etc. Yes, I have that much stuff. The garage (intended to be open) was off-limits at my last sale, for fear of someone hurting themselves. While I was ill, it all seemed to breed. Another sale is coming. Don't worry, I won't overdo it. I'm bringing in extra forces to help me organize it all. I'll keep you posted. Beautiful!! Ok, so I have 2 of those on my vintage vanity.. I must say they do NOT look any way near that pretty . Aha... now I have been inspired. :-) Will have pretty trays soon. Stunning. You take the most mundance simple things and make them so danged beautiful. Have a wonderful stress-free week. Ich kann nur sagen Beautiful! I am so impressed that you can even cut out the wood. The tray is beautiful. I have my mother's and will keep the mirror in it, and it will be painted white when I get back to the Midwest. I think I also have a small round one of hers, however, I can never get too many trays. They would also be great hanging on a wall. Again, you have done a master piece! Rosemary, I am glad you are doing well and brining in some help for shows. I love what you did. Great project! so pretty, and what a neat idea for something different! 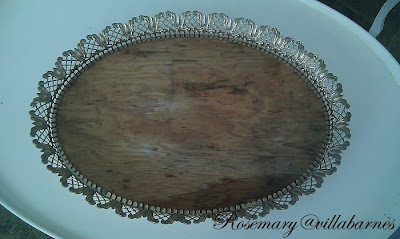 The dresser trays are very pretty with the wood bases. Love the faded flower patterns. 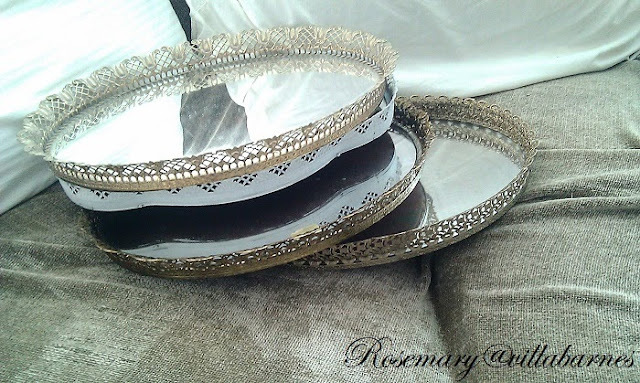 These mirrors look like they make for great trays, Rosemary! I love the design you did. PS have been having really hot weather here too. ugh! 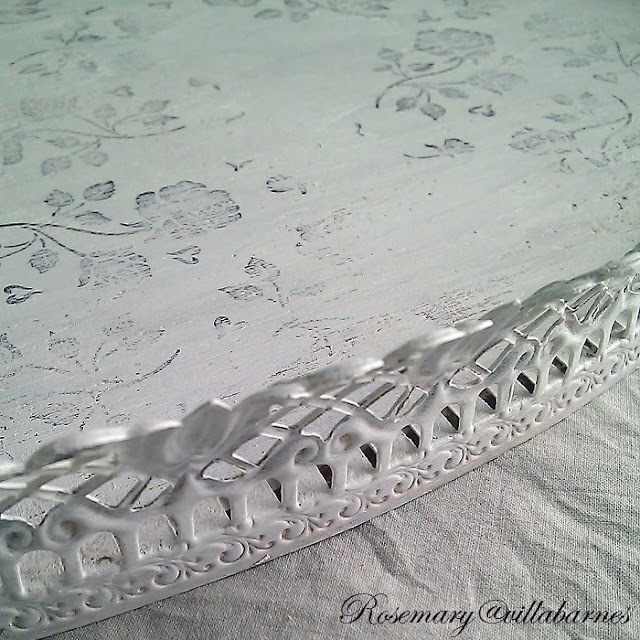 I don't think I'll ever look at one of those trays the same way again, Rosemary. :) What a charming idea! And so easy! Love it! So glad that the heatwave of 2013 is over with for you, too. That was brutal, wasn't it? I am in love with your gorgeous tray, Rosemary! I've seen those mirrors many times, and have always passed them up, as the mirrors usually are pretty worse for wear. This has got to be one of my very favorite projects of yours, love it!!! 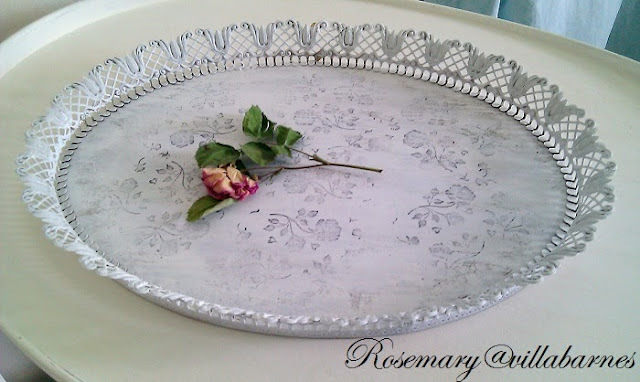 You always have the best ideas, Rosemary and this is really pretty. Take things slowly as you recover; I know how hard you work. You're an inspiration to us all. You are so creative! I am glad you are feeling better. Beautiful result Rosemary! Could you put a finish on mirror or reverse it for same look vs cutting new wood? Glad you're feeling better and hope to see you at a market soon! Direct reply not necessary..not sure if my blog has that!! Oh wow I too find the trays all the time but what you did with it is genius. 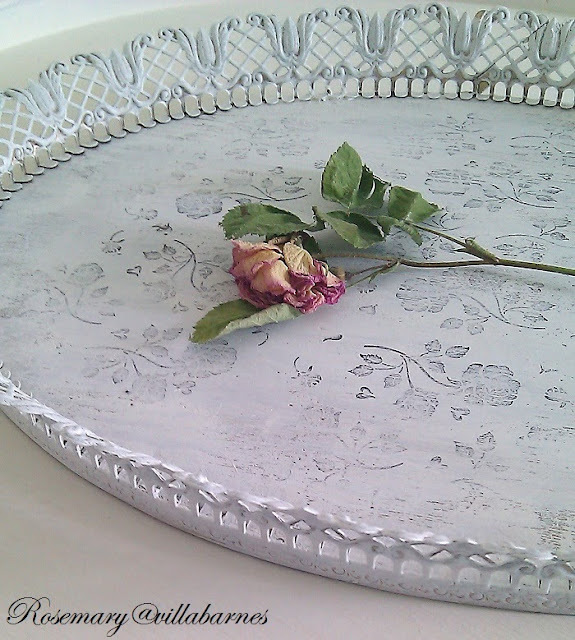 Gorgeous tray. you are so creative R! I like how you thought of redoing the mirror into a tray. It looks wonderful! I love this idea and just might have to try it. Happy to hear you'll have extra forces to help out with your upcoming shows. The tray is so pretty! Glad you have some help..stay cool!